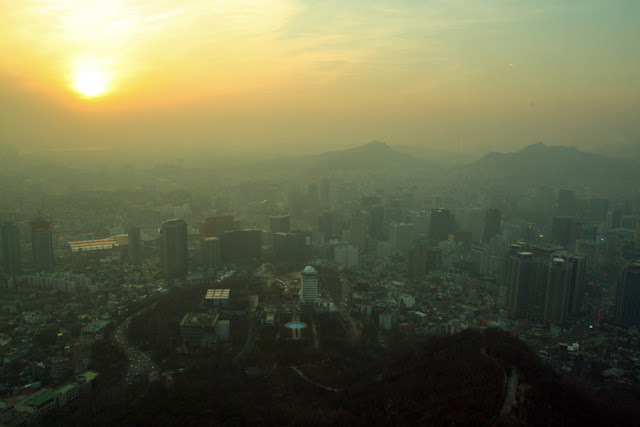 While waiting for the sun to go down for that night view at Namsan Tower, stroll around Namdaemun Market, the largest traditional market in Korea. Namdaemun (meaning "great south gate") Market wasn't in our itinerary, but we had a free day and I thought to meet another friend, Ga Yeong. 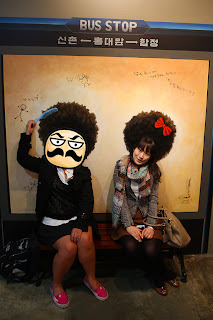 No specific plan for the day, I asked her to suggest a place, and Namdaemun market came up. A market? Great! I don't care if I have no money for shopping, a market is always a good place to explore. Let's go! With more than 10,000 stores you can find clothes, kitchenware, toys, souvenirs, hanboks, shoes, ginseng, food, anything and everything at Namdaemun. I was more attracted to the food than the other stuff. 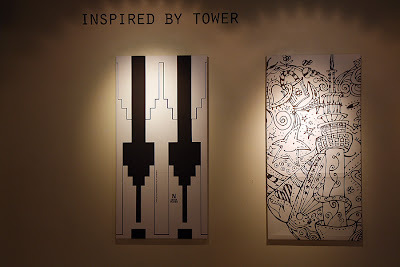 Left photo by Ayin Ersando. Right photo by Bee Chavez. 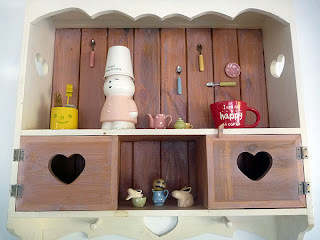 I didn't find anything cheap (in my thrifty standards). Or maybe I just wasn't looking hard for I had no plan of buying anything. One person goes "Hello! Where are you from?" "Philippines," we answer. And this Korean guy sings "Bayang magiliw, perlas ng silanganan..." and that made me stop in my tracks. That's how I was lured into watching them make kkultarae 꿀타래. 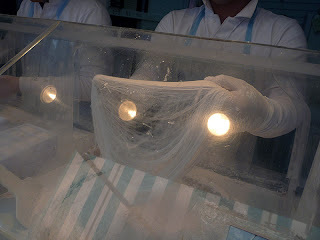 I was too mesmerized by how a hard lump of honey was made into threadlike things, to take a video never crossed my mind. Good thing some other person did. Kkultarae, meaning honey skein, is a sweet Korean snack made from the spun honey rolled with either peanuts or almonds inside. It was quite expensive, 5000 won for a box which contains just 10 pcs, but I just had to buy one. Yeah, food is my weakness. 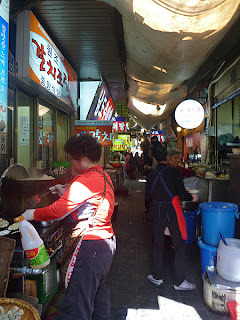 And speaking of food, we had lunch at Galchijorim Alley in Namdaemun Market. Galchijorim Alley where every restaurant sells galchijorim. Galchijorim 갈치조림 is boiled hairtail fish cooked with radish in soy sauce, red chili peppers, and garlic. The spicy broth is best eaten with rice and gim 김 (seaweed). 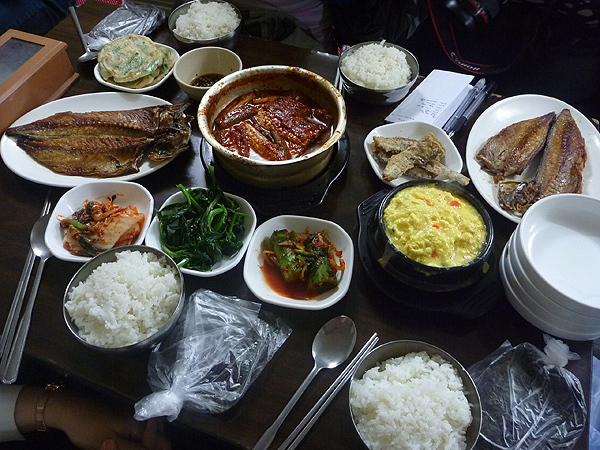 We also had fried godeungeo 고등어, a kind of mackerel. Of course, not to forget, the banchan (side dishes): pajeon (green onion pancake), geotjeori (cabbage kimchi), sigeumchi namul (spinach), oi-sobagi (cucumber kimchi with chili, garlic, fish sauce), eggs, and some kinda fish-jeon (fried fish coated in flour and egg). 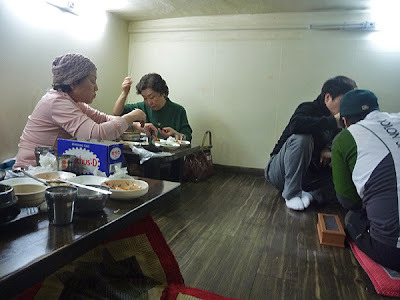 The place we ate in was a two storey made into three. 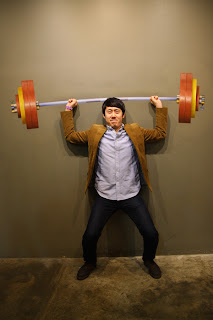 Take off your shoes, crouch to your table, squat on the floor, and enjoy your galchijorim! Burp! 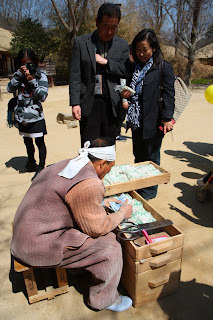 Don't forget to pay: 6000 won for one godeungoe, 6000 won for galchijorim, 1000 won for a serving of rice. Gim and the side dishes are free. Find your way: Take the subway to Hoehyeon Station (line 4/light blue) and take exit 5. 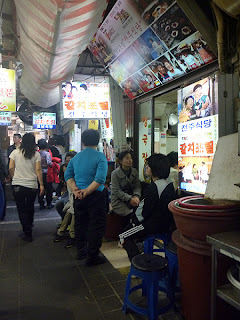 There are also many buses that stop by Namdaemun Market, see guide below. Hours: Any time, any day. 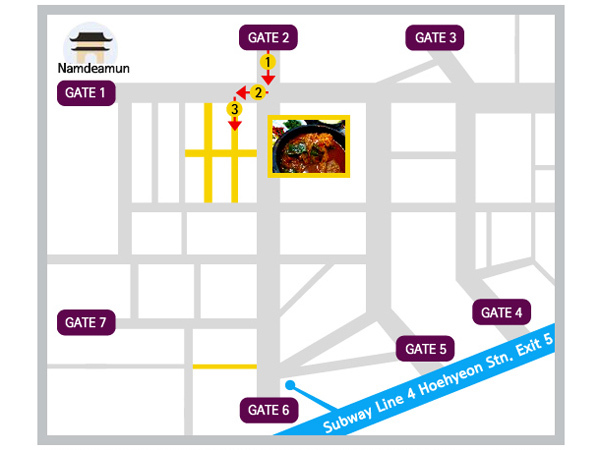 Find your way: Get yourself to Namdaemun Market and bring this map with you. 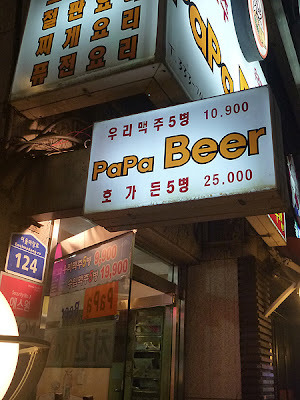 Where's Mama Beer and Baby Beer? 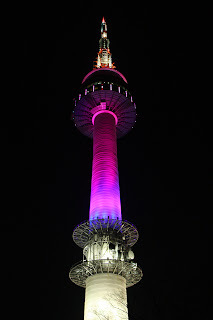 To see the Seoul skyline, head on to N Seoul Tower or Namsan Tower as the locals call it. You can either take the bus or get on a cable car. 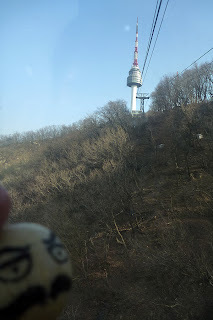 We took the cable car on the way to the tower and the bus on the way back. 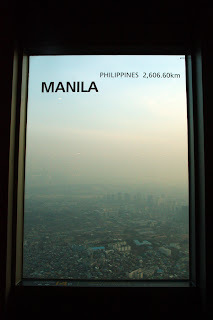 Though the cable car is more expensive than taking the bus, it is faster. It was a very short ride and the car was packed to the brim. Good thing we got on first so we almost had our faces pressed to the glass, but better than somebody's armpit as our view. Locals say the view is best at night. 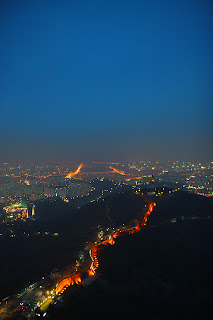 If you want to see the skyline when it's still light out but also want to see Seoul sparkling at night, go at least half an hour before sundown. Common sense. 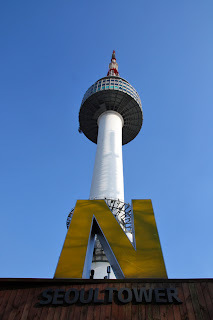 What else can you do at N Seoul Tower (which I was too cheap to do)? 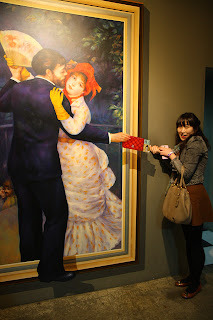 Spend money on food, check out the teddy bear museum, and buy an expensive lock to hang on one of their lock trees. 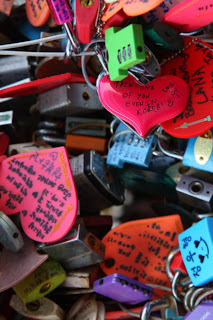 It is said that if lovers make a wish at Namsan, it will come true. If you and your lover plan to chain your love on their trees as a symbol of forever, bring your own lock and pen (unless money is no object). 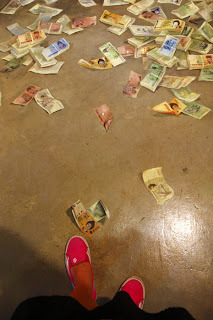 There were some people who probably forgot to bring a lock that they used their cellphone case, keychains, and even a small broom and dustpan. Find your way: Take the subway to Myeongdong station (line 4/light blue), exit 3. Walk about 10 minutes to the cable car station. If you'd rather take the bus (cheaper! ), take the subway to Chungmuro station (line 3/orange or line 4/light blue), exit 2, and hop on the yellow bus no. 2. You can also get on yellow bus no. 2 at Dongguk University station (line 3/orange). Yellow bus no. 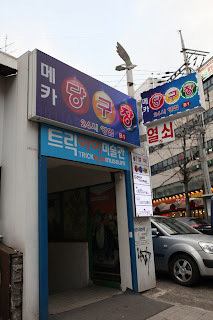 3 can be found at exit 4 of Itaewon station (line 6/brown) and exit 2 of Hangangjin station (line 6/brown). 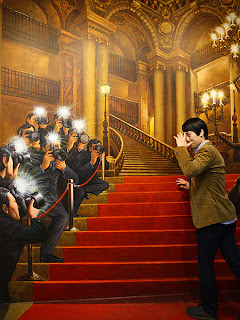 All you need at the trick eye museum are two hours of your time, a friend or two, a camera, and 13,000 won to click these two hours away. If you are alone, bring a tripod! You are meant to be in the pictures! Find your way: Take the subway to Hongik Station (line 2/green) and take exit 9. Walk 5-10 minutes (see map below). Spotted something new today. 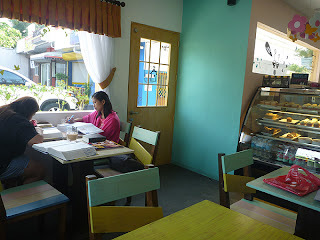 A little coffee shop a few paces from Thai Asian Cuisine de Cebu, just across Bright Academy. 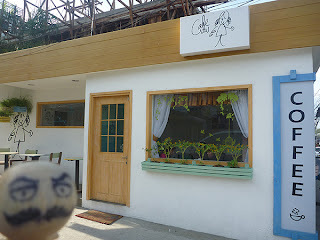 Always up for something new, I dragged my eating buddy to this little coffee shop. Nearing the cafe I read its name: Cafe Caw. Today they had three kinds of cupcakes (Php 60 each): red velvet, green tea, and I don't know what the third one was...maybe vanilla. The icing on their cupcakes looked like a mess, but I shouldn't judge a cupcake by its icing. They also had some unlabeled cookies and bars, one of the bars was probably oat fudge. I'm guessing here. Aside from those goodies they have waffles, cheeseburger, chicken wings, Hungarian sausage, pasta, and some other stuff I forgot to take note of (Php 140~165). Oh, and let's not forget, coffee (Php 60~115 a cup). 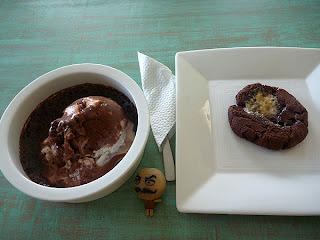 Since we came here for something cold and sweet, we zoomed in on the brownie a la mode and a cookie. 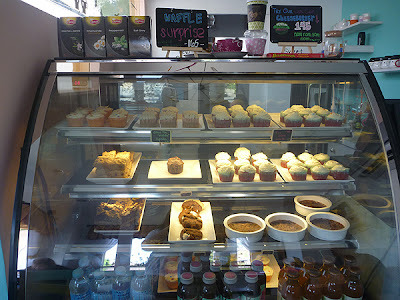 I wanted to try the green tea cupcake but couldn't bring myself to pay 60 pesos for one (it was just regular sized; maybe if it was bigger than usual I would have given it a shot). The brownie a la mode wasn't worth its price of Php 135. Yes, the bowl is big, but its circumference made up for its thickness, or should I say thinness (the brownie was about half a centimeter thick/thin). The only good thing here is, if you're a choco monster, you get a double dose of chocolate. Instead of the usual vanilla ice cream, they use rocky road. What about the cookie, you ask. They heated it so the marshmallow melted but it was nothing great. Whatever the food lacked, the place made up for. 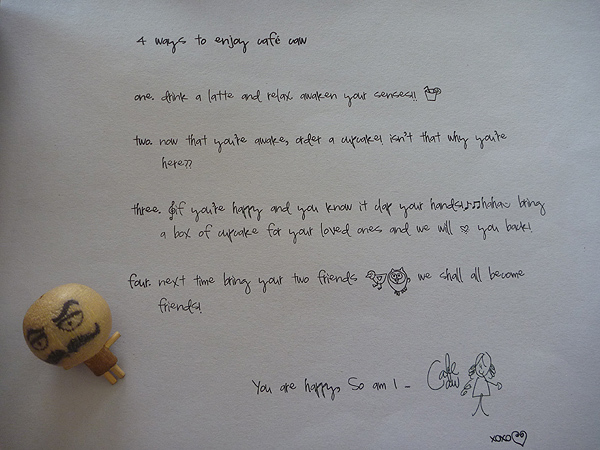 Cafe Caw is cute and cozy. Did I just use the word "cute"? I couldn't think of any other word really. 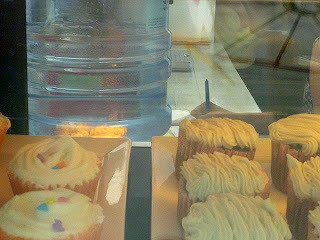 One thing that bugged me was that they "didn't have" service water though I spotted a water dispenser behind the display case. Yes, I had to buy a bottle of water for Php 25 to drown out all the sugar. 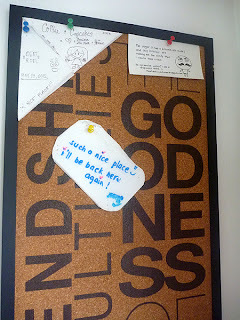 Looks like message boards are becoming popular in cafes. They have one too. And I couldn't help but leave a note. 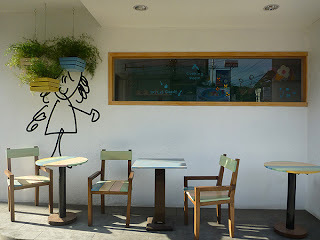 Read about Cafe Caw's Lahug branch here. 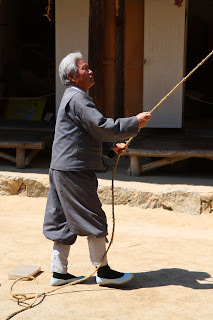 Stepping into Korean Folk Village brings one back to ancient times. Houses from different parts of the country, from different classes, also government buildings were relocated, restored, recreated. 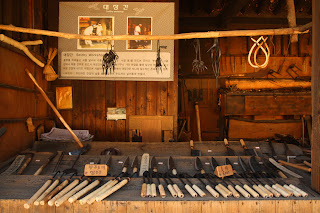 Korean Folk Village is like an amusement park slash outdoor museum. You can find houses of farmers, commoners, and the rich ones, and see how they differ in layout and construction. 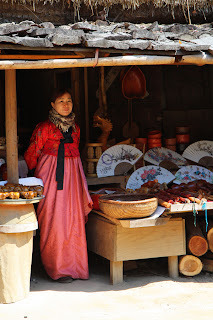 The folk village comes alive with its people in complete period garb. 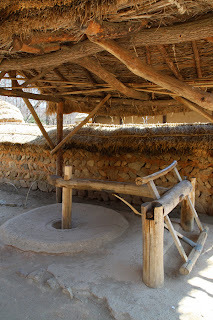 Some are skilled in making farming tools, weaving, woodcraft, etc. 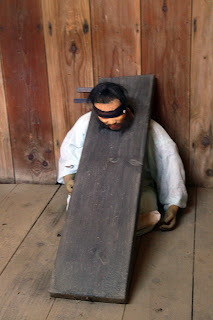 Whatever the artisans have made are then put up for sale. 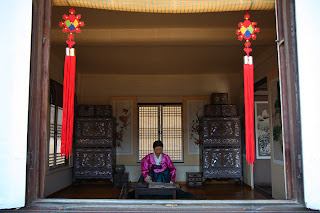 There are performances such as a traditional wedding and folk dances. You can find the schedule here. 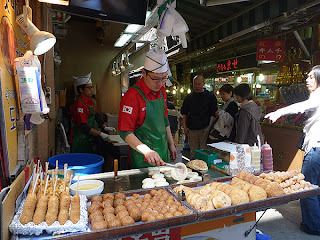 Snacks can be found while strolling around the village. 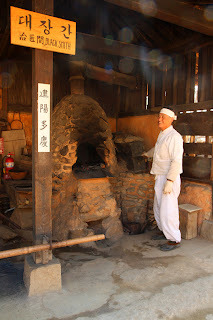 There are also tea houses and a traditional marketplace where local products and local dishes are available. Warning: food is expensive here. Find your way: Take the subway to Suwon station (line 1/blue), exit 4. Then take Bus 10-5 or Bus 37 (be sure to tell the driver to drop you off at Korean Folk Village, their route map/announcement doesn't have an English translation). Or better yet, catch the free shuttle bus in front of Suwon station every hour from 11AM to 3PM. Tip: Suwon station is about an hour from Seoul station. Make sure you take the right line, right train. Yes, it is line 1 (blue) but know that there are different end destinations for this line. 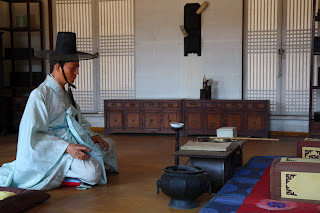 Try to be at Suwon station before 11AM to catch the free shuttle to the village. 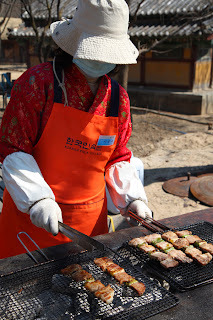 Spend at least 4 hours at Korean Folk Village and don't just breeze through everything.